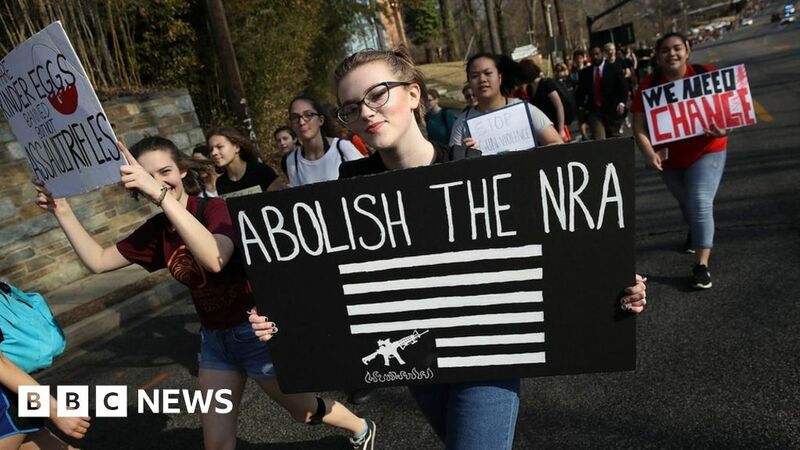 A number of US companies have cut ties with the National Rifle Association (NRA) as consumers urge a boycott of firms linked to the politically powerful gun lobby. The firms included car rental giant Enterprise Holdings, which offered discounts for NRA members. The moves follow NRA leader Wayne LaPierre’s speech defending gun rights. They were the NRA’s first public comments since a deadly school shooting in Florida. Mr LaPierre said “opportunists” were using the 14 February tragedy, in which 17 people were killed, to expand gun control and abolish US gun rights. Activists have tried to put pressure on the NRA since the shooting by targeting firms that offer discounts and other benefits to its members. They have flooded its corporate partners with comments on social media under the hashtag #BoycottNRA. Firms under pressure include delivery company FedEx and tech giants such as Amazon, which distributes NRA television programmes. On Thursday, the family-owned First National Bank of Omaha said it would not renew NRA-branded credit cards, citing “customer feedback”. Enterprise, which owns the rental car brands Alamo, Enterprise and National, also said discounts offered to NRA members would end on 26 March. The firm, which announced the move in response to comments on Twitter, declined to say why it had taken such a step. “We don’t sponsor, endorse or take a political stance on any organizations,” the company wrote on Twitter. Additional companies distanced themselves from the NRA on Friday. MetLife Insurance said it had ended a programme for NRA members, while Symantec Corp also said it would stop a programme with the NRA that offered discounts for its LifeLock identity theft product. Insurance firm Chubb said it had stopped underwriting an NRA-branded insurance policy three months ago. In Florida, the president of the Florida Education Association, which represents teachers’ unions, also called on the state to look at pension holdings in gun companies in a statement to the Miami Herald newspaper. The NRA, which claims five million members, did not respond to a request for comment. Prior campaigns aimed at the organisation have had limited results. President Donald Trump defended the NRA in a Tweet on Thursday, while others criticised the boycott on Twitter. The campaign comes as American businesses increasingly find themselves in the crosshairs of political debates, as activists target them on issues such as LGBTQ rights, as well as ties to the president. Companies such as retailer Nordstrom and sportswear brand Under Armour are among the firms that have been subject to calls for boycotts from the left and right. Executives serving on presidential councils, including the former chief executive of Uber, have resigned from the advisory groups after consumer pressure. The councils eventually disbanded last summer. North Carolina last year also rescinded a law that restricted bathrooms for transgender people after a boycott by businesses and sports leagues.